The Yankees took home rings in 1977, but didn't play the only good baseball that year. Putting each "leader" in context illustrates better who did what for whom. Carlton, PHI: No longer saddled with a team that sucked, Steve won 23 games for the 101-61 Phillies. His 153 ERA+ easily outdistanced the other four starters, none of whom reached 100. 17 complete games also totaled more than the rest of the staff put together. As thanks for all this work, the Dodgers knocked him around twice in the NLCS en route to the pennant. Goltz, MIN: Tied Palmer for AL lead in starts. More worryingly, led league in hits allowed. Twins go 84-77 mostly on his indefatigable arm and Rod Carew's pursuit of .400. Otherwise unheralded "closer" Tom Johnson wins 16 games, second-most on the team, as starters 2, 3, and 4 make "average" look good. Leonard, KC: Best pitcher on only Royals team to win 100+ games. Shared the love with Colborn, Splittorff, Bird, and Pattin, all of whom garner at least 10 victories. Dennis struck out 244 batsmen, by far his best yearly total, and serves up a sweet 'stache. Many O-Pee-Chee sets copy their Topps contemporaries card-for-card, adding only French flourishes and occasional "NOW WITH" notes for players on new teams. 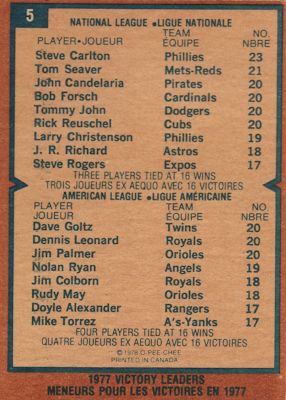 1978 OPC mixed things up a little by shortening the checklist to 242 cards and swapping the Record Breakers, typically the first several cards, with the League Leaders. 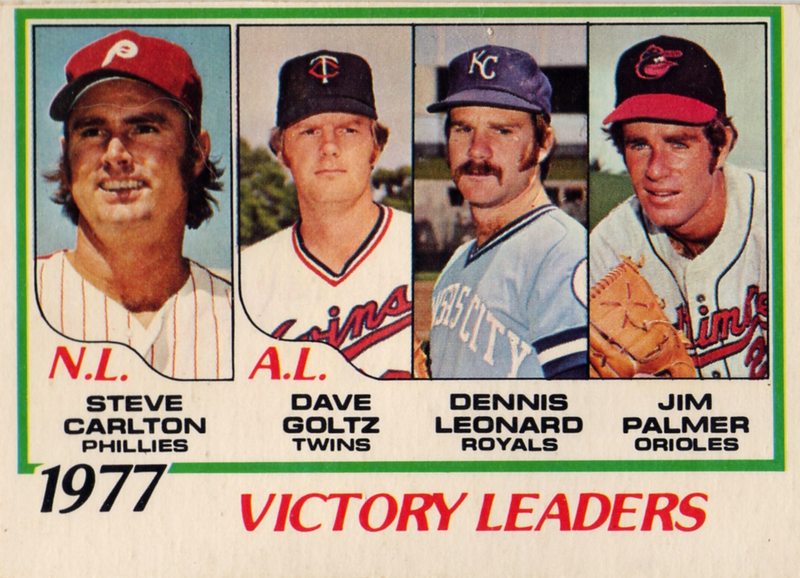 That turned 1978 Topps #5 into a Pete Rose card (RB for most lifetime switch-hits), while Canuck collectors got today's barbershop quartet of Winners. Zut alors, I like the choice to show LLs first. Value: OPC versions come in short supply compared to Topps, but values don't differ significantly. Leader cards, even those with HOFers like Carlton and Palmer, only cost a few dollars ungraded. Sellers that highlight them as "signficantly rarer" and "brimming with investment potential" should, IMHO, switch to decaf. A huge fan of OPC during the 70's. I just now noticed that after all those years the Jim Palmer photo looks like an early 70's shot. The "Baltimore" road jerseys stopped being used about 1972 or 1973. Never the less it's still a great photo and great card itself! Good catch on the uniform year. Jim definitely looks younger on the LL compared to his Topps card from the same year and it's a completely different glove.